AK Organizing » Entertaining? How to Declutter Before Your Guests Arrive! Entertaining? How to Declutter Before Your Guests Arrive! Are you hosting a holiday party at your home this year? There’s nothing like a strict deadline to inspire some fast decluttering. There are two reasons it’s actually easier to declutter under this kind of deadline: 1) You are highly motivated to get your home looking gorgeous and 2) You don’t have time to dilly dally. If clutter is the result of delayed decision making, a deadline will help you get laser focused and make decisions fast! 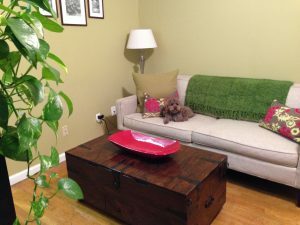 I recently hosted Thanksgiving at my home and it lit a fire under me to address some clutter that had accumulated in the corner of my living room as a result of reconfiguring my home office. If you are going to be hosting a holiday party or simply want to declutter a space FAST, here are 8 simple steps to help you get there! Set a Clear Goal – the first thing you’ll want to do is get clear on exactly what you want to accomplish. In this case my overall goal was to clear the space in preparation for hosting a holiday party but more specifically I wanted to get clear on what was in the space, go through the things I could process easily and get clear on what was left so that I could decide on next steps. Ask for Help – For this project I enlisted the help of my sister, Effie, who acted as a “body double” – she simply hung out while I worked. Her presence alone was grounding, supportive and helped me focus on the project at hand. She also drove me to our local Housing Works to drop off that giant bag of donations in the Crate and Barrel bag! A big piece of clutter gone! Sort and Categorize – In this step you are using broad brushstrokes – group like items together. Because 90% of the items here were from my recent home office project, they consisted of things like extra office supplies, a voluminous collection of organizing books form when I was studying to take the Certification exam, old files, and a collection of binders from professional conferences I’ve attended. Once you are clear on exactly what you’ve got, you can prioritize how to address each grouping. Set a timer – I set my iPhone timer to 30 minute increments so that I can measure my progress as I move forward. I also put time limits on things. For example, I’ll give myself 30 minutes to review a box of old files. Once the 30 minutes are up I decide whether I want to continue working on the same item for an additional 30 minutes or whether it’s time to move on. Start with the Obvious – These are items you can take care of super fast – the items that will give you the most bang for your buck. See that big blue box against the wall? It’s got extra office supplies in it. My office supplies are stored in the Taka trunk that doubles as a coffee table. Within minutes I was able to put the supplies away, break down the box and put it in the recycling bag – very gratifying! Be Realistic – There are certain things you will be able to deal with on the spot and others that will need to wait. I ran into this when I discovered that I need more space for my books. This means that I either need to thin out my bookshelves to make room for new books OR purchase additional storage. This project was not going to happen right away so I put it on hold. Let go, let go, let go – Although you can’t see it in the photo, there were 3 years of appointment books and about 10 spiral notebooks that I keep my notes in. Although it was momentarily fun to go down memory lane, the truth s I NEVER reference those books. OUT they went. Find a temporary parking space – Once you’ve sorted everything into categories and gotten rid of all the stuff you could in this round, decide on a temporary parking space for whatever is left. For me, there were things like the binders from conferences and some additional files that I wanted to look through more closely. I stacked them in neat piles and moved them into the bedroom. I chose my bedroom rather than the basement simply because I really can’t stand clutter in my bedroom (It’s a feng shui thing – it affects my sleep, LOL) so I knew that I’d address them very soon. If I put them in the basement, I would forget about them. Avoid what I have coined “boxes and bags syndrome” – sweeping everything in boxes or bags and stuffing it in the back of a closet or worse yet in storage! 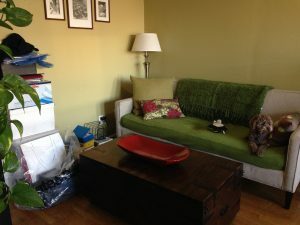 Are you having guests this holiday season and need to do some FAST decluttering before the big day? Use this high motivation, deadline driven time to do some power decluttering. You’ll be laser focused, will make decisions faster and let go of things more easily! How do you deal with clutter before a holiday party – do you resort to what I call the “boxes and bags syndrome” or do you ride the wave to do some power decluttering? Leave a comment below and let us know!